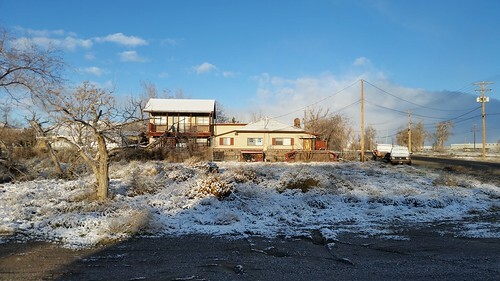 The latest storms lashed the Sierra Nevada yesterday, closing a long stretch of Interstate 80 and causing the Nevada Department of Transportation to issue an advisory to big rigs asking them to please not come to Reno and to try and find places to lay up east of the area. (This was good news for the truck stops in Fernley.) Last night, it finally got cold enough for snow to start falling again here in Fernley. This morning, I awoke to find about 2-3 cm of snow on the porch and the adjacent field, but the roads and sidewalks were clear. I went for a short walk around the block to get this picture. The storm has moved on, the skies have cleared, and as of noon today, nearly all of the snow has already melted except in shaded areas.